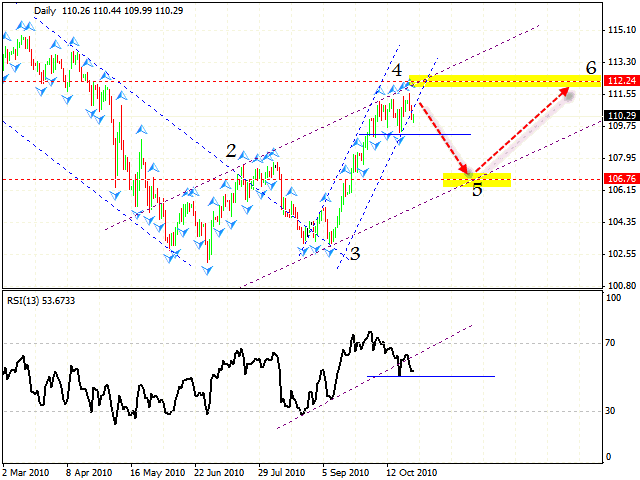 HomeFor ClientsAnalyticsForex Analysis & ForecastsForex Technical analysis and forecastsForex Technical Analysis 2010/10/27. EUR/USD, NZD/USD, AUD/USD, Euro Index Forecast. Forex Technical Analysis 2010/10/27. EUR/USD, NZD/USD, AUD/USD, Euro Index Forecast. Judging by eur usd technical analysis, the EUR/USD currency pair is still under correction. 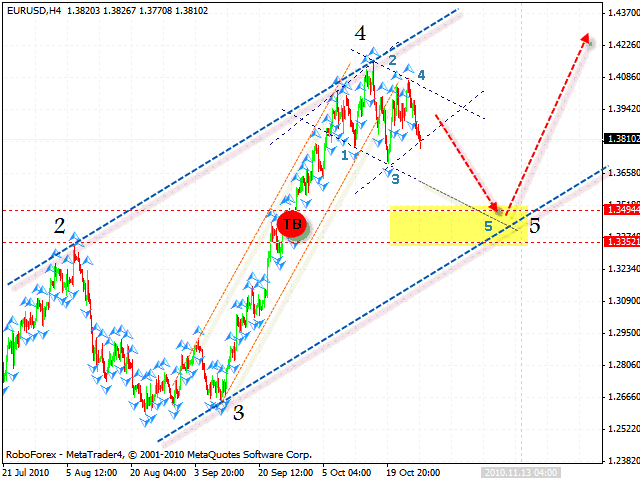 At the moment we have “diamond” reversal pattern forming with the target in the 1.3352. It’s much lower than the level for the 5th point of reference, that’s why we recommend capturing the sales profit in the area of 1.3440 or even a bit higher. Don’t forget that this descending movement is just a correction and the price will eventually go up into the area of 1.4800. 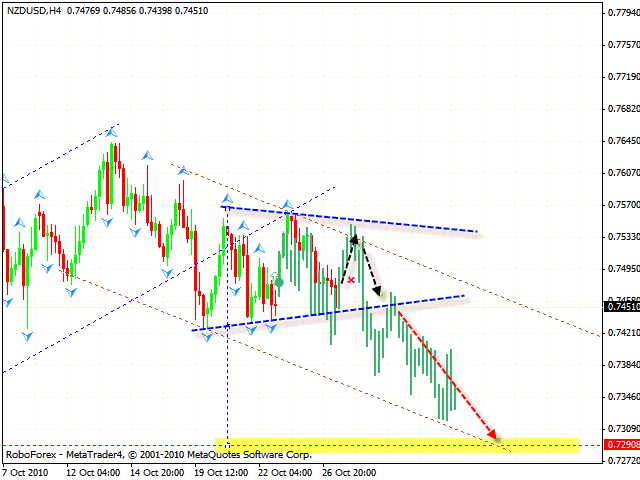 According to nzdusd forecast, New Zealand Dollar is stuck inside the “triangle” pattern. Before falling into the area of 0.7290, the price will probably move to the upper border once more. In case the “triangle” is broken downwards, one should consider the tight stop sales. While all currency pairs are being corrected, Australian Dollar keeps moving down. If the support level is broken, we will probably see the formation of the “double top” reversal pattern. In case the price tests the lower border of the rising channel, judging by aud usd analysis, you can try to buy the pair with the target in the area of 1.0500. It’s possible that Australian Dollar is just in the middle of its rising trend. Euro Index has completed the rising pattern and defined the place for the formation of the 4th point of reference. At the RSI forex indicator we can see that the line of the rising trend has been broken, leading to the beginning of a possible correction. 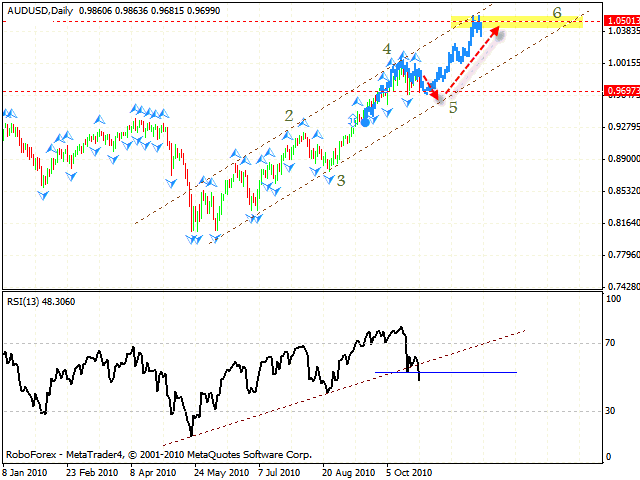 Also at the RSI we have “failure swing” reversal signal forming with the target at the support level. Currently we should expect that the price is going to move down into the area of 106.76. Then we will probably see a final wave of Euro Index growth to the level of 112.24.